Land of a thousand spices, aromas, and culinary traditions: India is, without a doubt, a dream destination for foodies. Given the subcontinent’s size and population, it’s no surprise that there are hundreds of different micro-cuisines to be found here, and each city is filled with restaurants that capture the best of its local cooking. From roadside eateries to fine dining establishments, we’ve selected the best restaurants in India to inspire a culinary adventure. 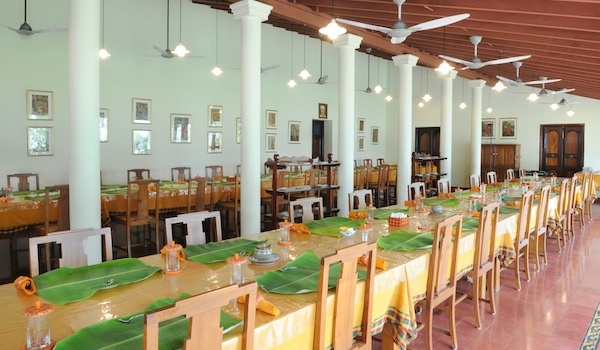 The restaurant at The Bangala hotel serves accomplished Chettinad dishes, with a large, glossy banana leaf used in place of a plate. A region that’s renowned for its hospitality, Chettinad is home to mouth-tingling dishes like chicken pepper fry; these traditional preparations are mixed with colonial era-inspired fare, like mint and potato croquettes, for a winning multi-course meal. For those looking to sample an authentic bite of Hyderabadi fare, Hotel Shadab is the place to go. Its main staple is the beloved local dish of biryani, a delectable layered mixture of rice and curry – usually meat, though vegetarian versions of the dish can be found here as well. The place is often packed up with families, sharing a hearty feast together. 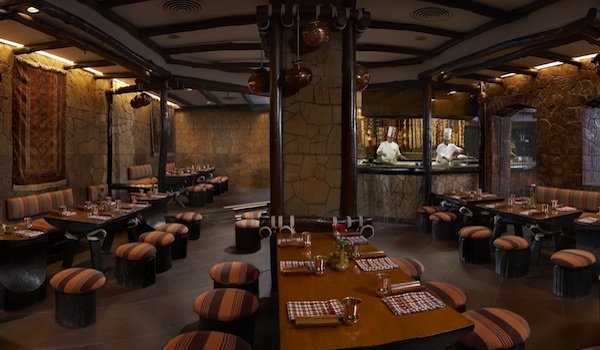 One of India’s leading culinary lights since its founding in 1977, Bukhara, located within the ITC Maurya Hotel, serves cuisine inspired by the rugged Northwest frontier. Chef JP Singh cooks hearty, meat-heavy fare that’s eaten by hand with flaky paratha bread. Within its dark, rustic dining room, food lovers will experience a uniquely Indian version of fine dining. Hidden away in a labyrinthine quarter of old Mumbai, Shree Thaker Bhojanalay is the undisputed champion of Gujarati thali. Thali, or a platter of small dishes served in a series of bowls and complemented by various chutneys and breads, is a fantastic way to sample a number of offerings in one go; given its Gujarati culinary heritage, diners here can expect dishes like rotli (flatbread), kadhi (chickpea flour kaporas with yogurt), and shaak (vegetables cooked in gravy), all washed down with a glass or few of chaas (buttermilk). 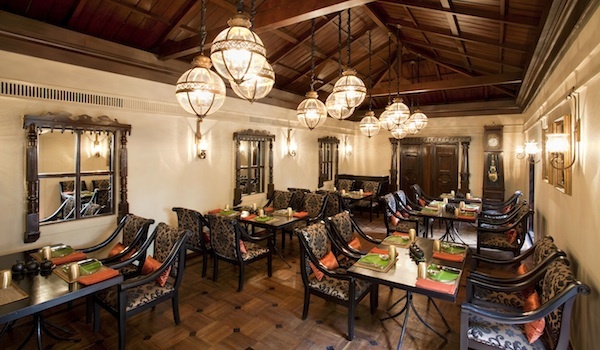 Recently refurbished, the 22 year-old Karavalli pulls from a huge array of traditional Southern Indian cooking communities – from the Kodavas of Coorg to the Syrian Christians of Travancore, with even a touch of Goan Portuguese inspiration. The result is a unique blend that showcases the region’s incredible diversity. One in a series of eateries by reigning Mumbai restaurateur Rahul Akerkar, Neel is a renovated version of his previous concept, Tote. Serving artful interpretations of Muslim Nawabi cuisine (with some Western influences and ingredients present as well), the restaurant blends the traditional and the modern. Regularly ranked as one of India’s best modern restaurants, the lavish Indian Accent in the Manor hotel turns to a number of other countries and cultures when developing its fusion fare. Scottish salmon meets Japanese miso and Indian masala, while galawat is stuffed with foie gras. Based in the Colaba area of Mumbai, Bademiya is one of the city’s most revered street food stalls. Serving simple, spicy, and deliriously good kebabs and rotis, the casual eatery has for years attracted hordes of late night eaters, though recently it’s responded to the acclaim by growing, installing a few pavement seats, and even employing a wait staff. Vegetarians can also snack on its paneer rolls and bhajis, while keema roti should be on every carnivore’s list. 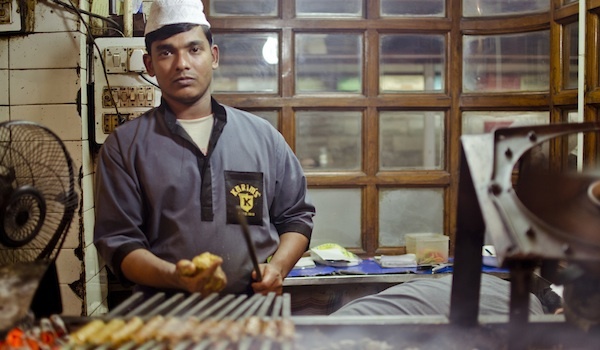 Not simply a restaurant, but also a local institution, Karim’s in Old Delhi recently celebrated 100 years in business. Its origins go back even further, supposedly to the 19th century royal court. These days, it’s still serving flawless renditions of its classic plates, from seekh kebabs to roasted baby goat. Taking inspiration from the melting pot that is the Punjab region, Punjab Grill, with outposts across India, brings together rich culinary inspiration to craft its culture-crossing menu. Bridging Sikh, Muslin, Hindu, and Pathan cuisines, the restaurant chain is especially renowned for their four kebab varieties and Tandoori duck, though a number of vegetarian dishes are also available. 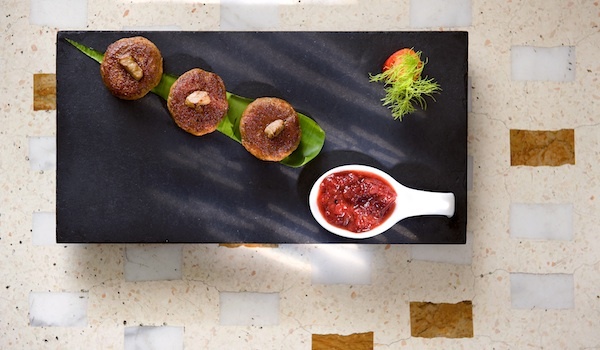 Repeatedly singled out as one of the top restaurants in India, and the recipient of the ‘Best Wine List in Mumbai,’ award, The Table brings fusion global cooking to Mumbai. 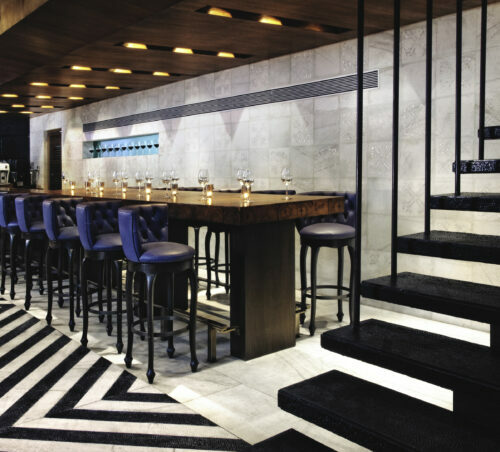 Its stylish interior, decked out with striped floors and filled with plush furnishings, complements the restaurant’s menu of fine dining offerings. 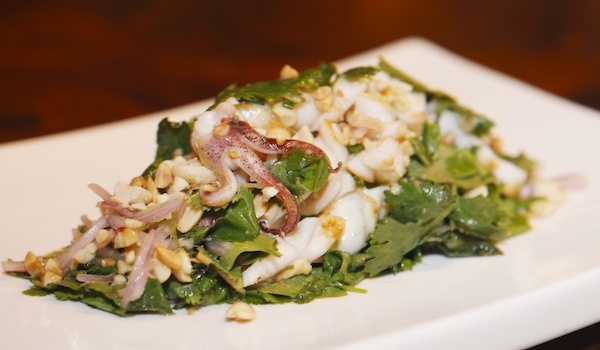 Hailing from San Francisco, Chef Alex Sanchez takes inspiration from his San Francisco birthplace when devising his menu of fresh, seasonal cooking. The Chennai-founded Hotel Saravana Bhawan is now a highly regarded chain of all-vegetarian Indian restaurants, located in several cities across the subcontinent. No matter which outlet you visit, though, you’ll have choices: the restaurant proudly offers over 350 dishes cooked in 10 different styles.